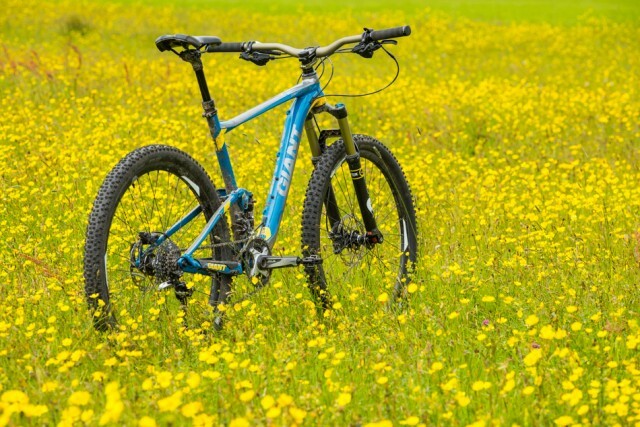 The Anthem has been Giant’s XC weapon of choice for years now, a permanent fixture of their range. 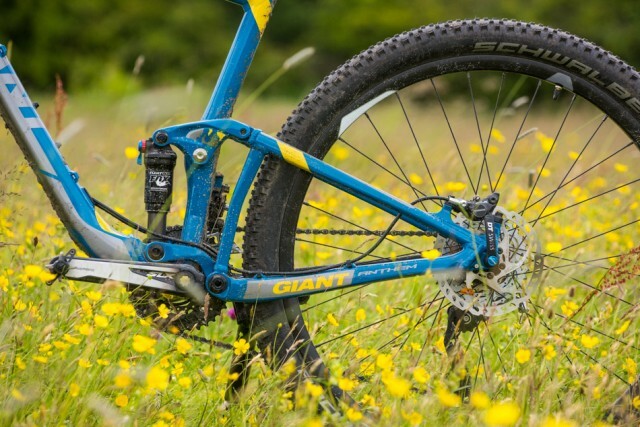 Much like Giant’s Maestro suspension system the Anthem has been tweaked and refined over the years most notably being re-jigged to change with wheel sizes, from 26in to 29in and finally to 27.5in. The Anthem has always been a candidate for some aftermarket tuning. The fast and capable chassis has often come with some parts that limit its all round ability in the name of staying true to its XC categorisation. It’s not unusual therefore to see Anthems that have been upgraded by their owners with slightly longer forks, a dropper post and a less head-down cockpit. 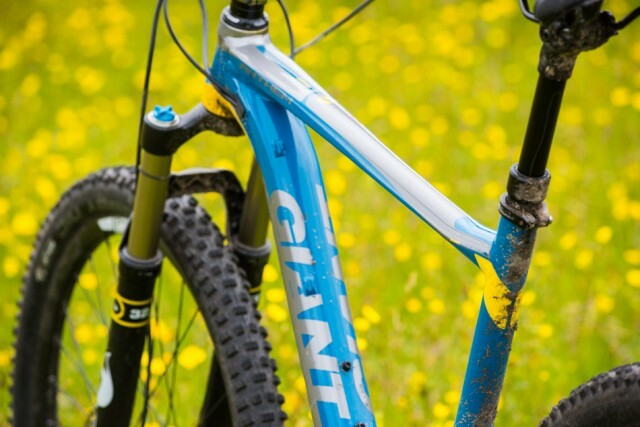 It seems that Giant has taken some of this onboard with the Anthem SX. 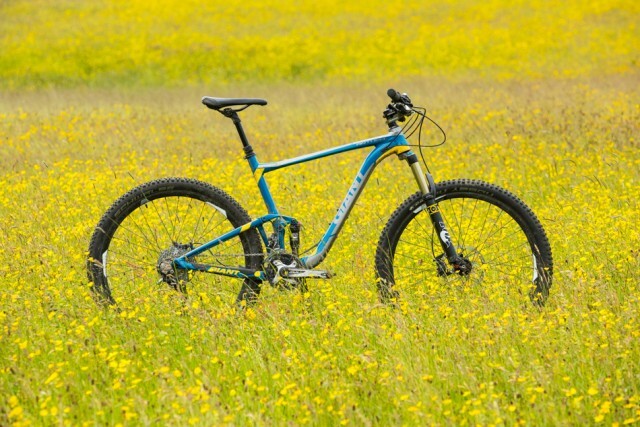 The SX moniker denotes that this is the bike that is purpose built with fun as the number one criteria. 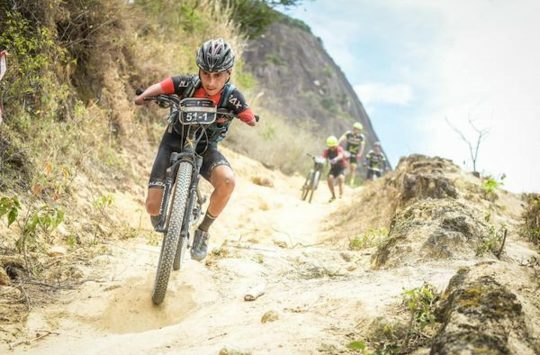 Racers will still want the regular Anthem, trail riders, you might like to step this way. The main characteristic of the SX is that it has mismatched travel with 120mm of travel up front and 100mm in the rear. 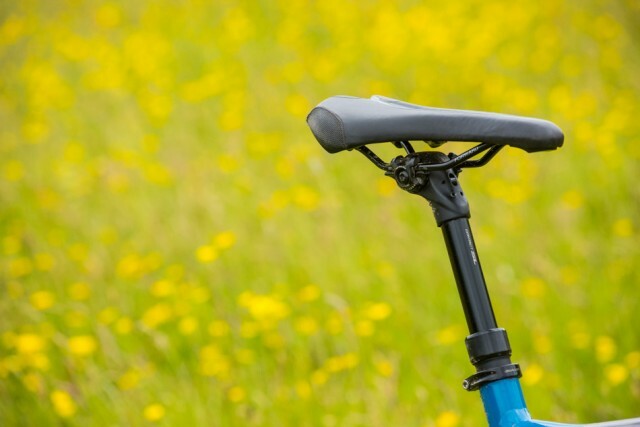 Some people can’t get their heads around this concept but it’s something that the UK in particular seems to have a penchant for, a legacy of our obsession with fitting too-long forks to hardtails perhaps. Retailing for a penny shy of £2,000 the Anthem SX does a decent job of making that money go a long way. Fox suspension front and rear, SLX/XT 2×10 drivetrain, SLX brakes, you even get a dropper post. There’s not much to complain about. As is customary the stem was swapped for a something shorter, going from 80mm to 50mm. Despite Giant’s website telling me that at 5’10” and with a 32” inside leg measurement I should ride a medium further inspection of the geometry table meant I went with a large, better suiting my preferences for a longer toptube and wheelbase. Giant are masters of aluminium manipulation, the hydroformed, shaped, extruded and contorted frame is testament to their ability. Whether the frame is actually aesthetically pleasing is another matter – ‘gangly’ was the word most used to describe the frame. The short headtube, tiny shock and the resulting huge space in the front triangle do give it a slightly awkward appearance. The Fox Float CTD rear shock offers up 100mm of travel and while being a CTD shock it does offer the option of flicking between Climb, Trail and Descend modes I found that Trail mode offered the best all round feel, which is just as well as reaching down to flick the lever and change the setting is no easy task. 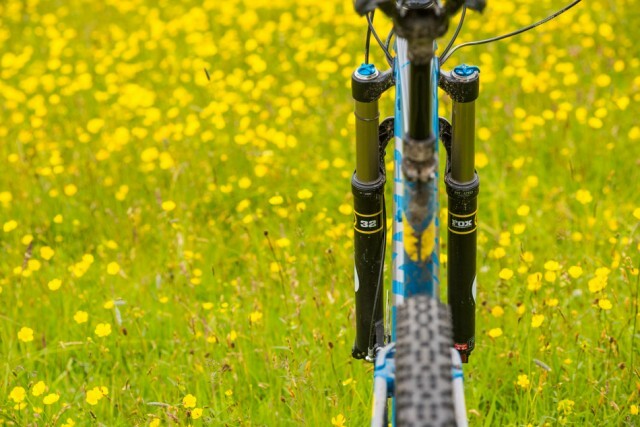 A set of 120mm Fox 32 CTD forks grace the front of the bike. It’d be easy to write them off instantly as being flexy and a limiting factor, but they do seem to match the overall character of the bike. Wheels are Giants own P-XC rims and hubs, not particularly light but they seem sturdy and the silent hub does add to a feeling of speed. 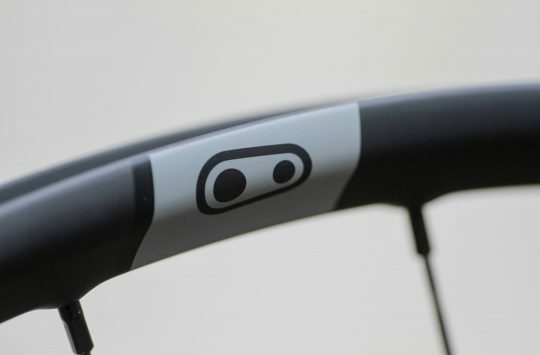 Interestingly the rear hub uses a 135mm spacing, in a 142mm world this does seem a bit of an oddity. The Nobby Nic and Racing Ralphs pairing certainly add zip to the ride and in dry or slightly soft conditions the hard compound actually works quite well, when things get greasy they give up the ghost though and don’t get too carried away in rocky sections, the sidewalls are wafer thin. 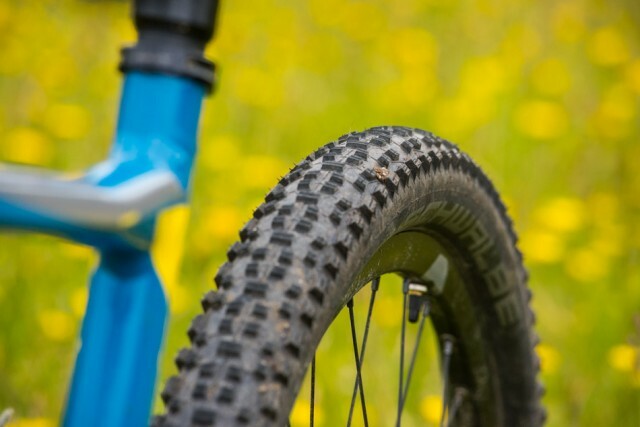 Tubeless is the the number one upgrade for this bike. 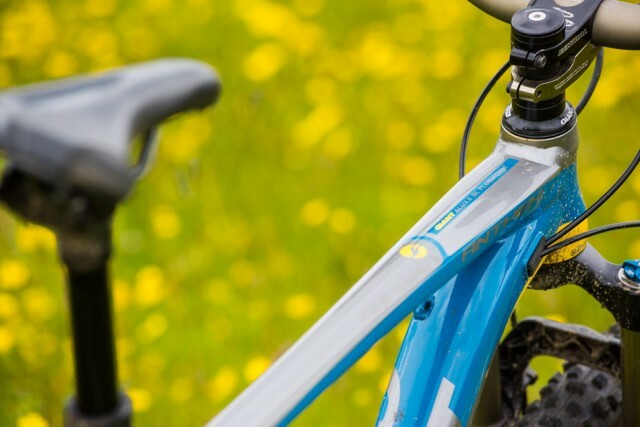 Giant’s own Contact-SL dropper post may look basic but it proved reliable and helped to make the Anthem SX a more versatile beast. 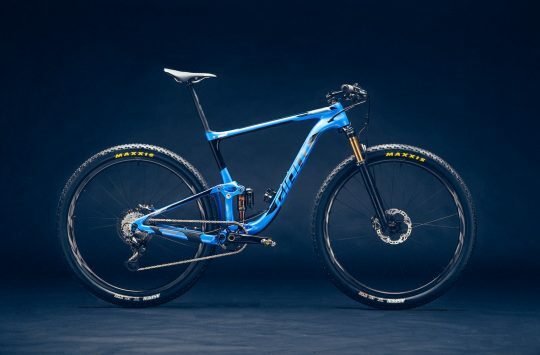 Interestingly Giant only bring one Anthem SX model into the UK, other countries can get their hands on the carbon framed Anthem Advanced SX which comes with a Rockshox Revelation and SRAM X01 drivetrain. The Anthem SX is greater than the sum of its parts, but more importantly it’s greater than the sum of its geometry. The start of every ride was the same, the headangle felt a touch too steep and the seatangle way too slack but on the trail it all just worked. That’s always been the case with the Anthem line, on paper and on initial inspection they just don’t make sense but in reality they somehow do. The faster you go the better it gets, to a point. At that point you’ll realise you’ve bitten off more than you can chew and the Anthem isn’t going to help you get out of trouble. The Fox 32 forks match the characteristics of the frame but again when pushed leave you wanting for a fork that doesn’t feel like it’s tucking underneath the downtube. I often found myself picking lines not particularly compatible with a short travel bike, the fun factor lulling me into a false sense of security. The Maestro system makes prudent use of the limited travel, it all gets used quite readily but never in such a way that you’re aware of it bottoming out or being a limiting factor. The Anthem in 29in wheeled guise was one of the most capable, yet fun, short travel bikes I have ridden, so how did the smaller wheeled SX compare? In the fun stakes I’d say it just edges the big wheeler, it has more get up and go, is more willing to change direction quickly and encourages general bad (but good) behaviour. That said if you’re planning on covering distance the bigger wheels are the clear winner. 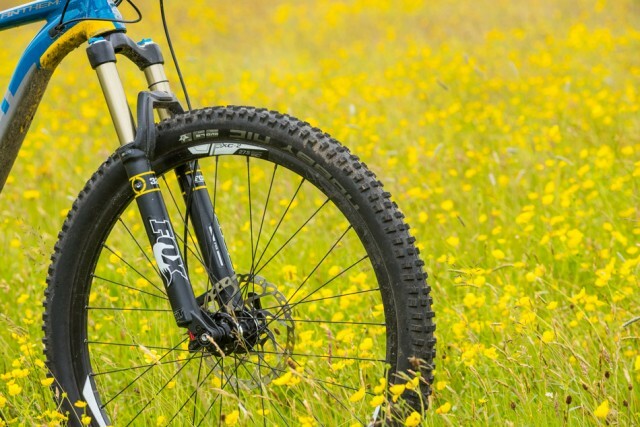 Thankfully you can still get the Anthem X 29er, giving riders the choice of wheel sizes, at least for now, Giant are committed to 27.5in so who knows if they’ll keep the 29in option available in the future. Which I’m guessing would be correct for the bike as supplied, ie with the 80mm stem? I’m guessing from experience that the ETT/reach difference between large and medium are about 30mm? ie what you you’ve dropped in the stem length?